NASHVILLE – An investigation by Special Agents with the Drug Investigation Division of the Tennessee Bureau of Investigation and detectives with the Murfreesboro Police Department has resulted in the arrest of a Rutherford County man on a heroin-related charge. On November 17th, two individuals in Murfreesboro suffered non-fatal drug overdoses. Heroin recovered from the overdose victims was examined at the TBI forensics lab, and tested positive for the presence of fentanyl. Agents were able to develop information that identified the source of the heroin. Working with officers with the Murfreesboro Police Department and State Probation and Parole, they executed a search warrant at a residence on North Academy Street, and recovered heroin from that home. On Friday night, Agents arrested Richard Dale Bain (DOB 06/04/1982) and charged him with one count of Possession of Schedule I. 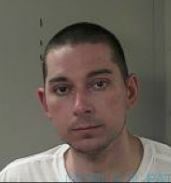 He was booked into the Rutherford County Jail on a $10,000 bond.